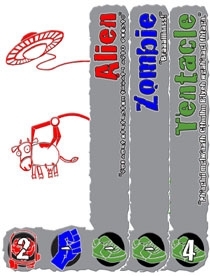 Alien Zombie Tentacle Apocalypse expansion. A simple pack of two new characters so you can have up to seven players, plus seventeen new gear, events and hybrid monsters (alien zombies, zombie tentacles, tentacled aliens). If you want to add some new cards to your AZTA mix, it's just a buck.